As a scientist, I often attend conferences/meetings/etc. Making this work as a childless, married academic husband was reasonably straightforward for my wife and me. However, things changed in April of 2018 when our daughter was born. Finding a way to integrate our daughter into this schedule is important because academic life bleeds heavily into times that are normally reserved for family life (weekends, evenings). Many academic conferences and events are scheduled over a weekend or involve weekend travel. What works for us is that I will take the baby with me when I travel for trips where it makes sense for both of our schedules. In our daughter’s first six months, I traveled roughly 25,000 miles with her via air, car, and Amtrak. Here I’m compiling some observations from my travel that may be informative or helpful to others. Visiting the Broad Institute on the first solo trip I took with our daughter, which we did via Amtrak. A good backpack beats a diaper bag. I received an Aer Travel Pack 2 as a gift and used it as a travel backpack for some time before our daughter was born. It was fine for that, but it makes a great travel diaper bag. The features that I have found most important are that 1) electronics get stored in a separate, padded compartment; 2) the separate “shoe compartment” can be used for soiled clothes (or diapers if you haven’t found a place to dispose of them) wrapped in a plastic bag; 3) it opens like a clamshell, so you can access different contents easily: I store diapers and wipes at the bottom, a couple changes of clothes above that, and then bottles, formula, and toys at the top; and 4) it fits under the seats of nearly all aircraft (there are a few aircraft types that have very narrow underseat storage for the aisle seat where it won’t fit). Have a support for the baby on your lap. I’ve had good success with a Boppy pillow. These things look like a huge neck pillow for the waist. I’ve found this helps with feeding, but it also gives our baby something to sleep on during the flight. For me, it reduces the discomfort from having her on my lap for long stretches. Bring a few toys, but find a bunch more. Our baby’s philosophy seems to be that an object is just a toy she hasn’t figured out how to have fun with yet. Travel leads to lots of new objects. We’ve had fun with snack mix bags, plastic cups, spoons, and many other items. I’ve had good luck bringing a few toys and planning to find more along the way. My travel go-to items for baby moving are an Ergobaby carrier, travel stroller, and car seat. I like a travel stroller that the car seat gets attached to via a strap that goes where the seat belt would be. In general, I use these as one would expect. The best way I’ve found to board a plane solo is to, a few minutes before boarding begins, put the baby into the ergobaby. Wheel the stroller with the car seat inside down the ramp. Fold the stroller and place both the stroller and the car seat at the end of the ramp for the ground crew. For deplaning, I do this in reverse. Finding a routine that works has helped me to keep everything together in some hectic situations. The one caveat of going this route is to note that you need two gate-check tags - one for the stroller and a second one for the car seat. Napping on the Boppy pillow. Everything’s a toy! This cup was a big hit with me in Houston. Car seat, stroller, Boppy in the walking-through-the-airport configuration. Traveling with formula was the best option for me. I traveled with a cooler of breastmilk for the first trip I took with our baby, which was via Amtrak. It dramatically increased how much I needed to carry, the logistics involved with timing, and meant that I needed to make absolutely sure that the hotel would have a suitably cold fridge (and freezer) on arrival. It is something that is possible to do via train. I only did this for the first trip, though I looked at what it would take to pack for travel via air and decided against for subsequent trips. Formula is easier for me since I can easily pack it or buy it upon arrival. Feed when the baby is hungry, and stay consistent in the size of the bottle. For the first trips I had planned out when our baby would be hungry based on her normal schedule, and so I knew where I would be for each one. Unfortunately, travel seems to alter babies eating schedules in unpredictable ways. I tried to compensate by feeding an “interim” bottle that was half-size to tide her over to the planned feeding time, but I have found this to be a path straight to a fussy baby and don’t recommend it. Whenever I find the perfect size cups, I ask for a few. When I travel with room-temperature formula and happen across paper cups for hot drinks that hold the bottle plus a roughly equal amount of water, I snag a few. When I ask for water to heat up formula on a plane, I usually get near-boiling water (when I use this water to heat formula, I let the water cool just a little bit, and then swirl the formula pretty quickly while it’s warming - I didn’t do this the first time, cooked the formula, and had to throw it out and start over). I’ve found that with the rate of heat loss from such cups, equal amounts of formula and water is about the right size to get a suitably warm bottle of formula for our baby. If the volume of the cup is too large the formula ends up too hot and I increase the risk of cooking it. If it’s too low, our baby won’t drink it. Flights with a connection are better for longer itineraries. When I traveled alone, I preferred the direct flight. I’ve found that when traveling with a baby, the opportunity to disembark, walk around a little bit, feed and change the baby in a less cramped space, and then continue to the destination is far more compatible with the happiness of me and our baby. As a side benefit, these flights are often a bit cheaper than direct ones. Airline club membership is helpful when traveling with an infant. In 2017, I flew enough that I had complimentary access to Delta’s Sky Clubs in 2018. 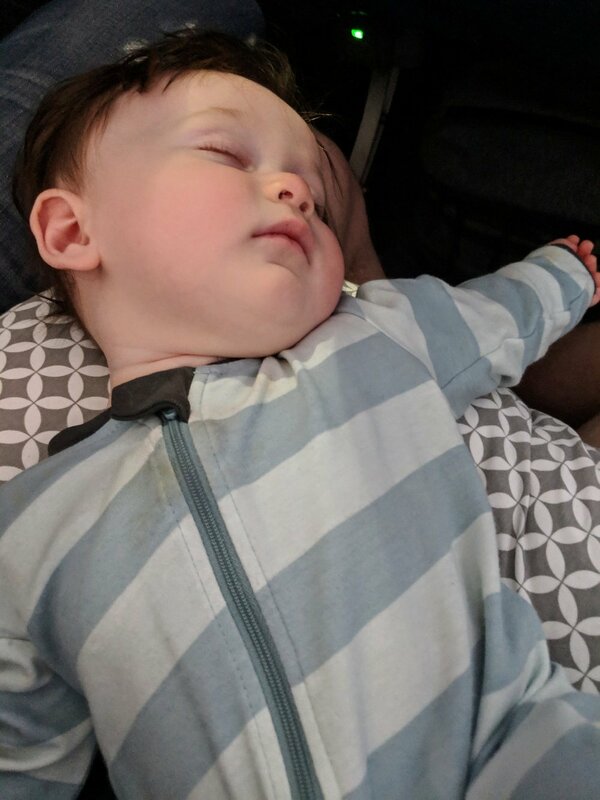 The ability to take my stuff and baby in, set the stuff down, get a bite of food and some water, eat, feed the baby, change the baby, and get to the next flight made all of this far more pleasant. Certain aircraft do not have changing tables in the restrooms. Delta flies a number of older aircraft (MD-88s, MD-90s, and 717s) and they use them heavily for flights to Philadelphia. The existence of changing tables on these aircraft has been hit or miss. If they do have changing tables, they’re usually in one of the economy restrooms in the tail. At least on Delta, you won’t know this when you book - only when you look. You probably want to check all three restrooms unless you are comfortable changing an infant who you are holding vertically. I’ve had to change three blowouts while holding our baby vertically in these aircraft without any tables. It’s something you get ok at. I highly recommend traveling with the baby in either kimono-style onesies or zippy jamz pajamas. Anything that goes over the head is bad news for a standing blowout change. Ask for more cabin comfort. The time that this most comes to mind for me was an early morning flight out of Houston’s Hobby Airport. We’d gotten up around 4AM to catch a 6AM flight, and the aircraft was inordinately warm when we boarded. My daughter actually did ok during the boarding process, but the flight continued to warm up on ascent. My daughter started crying and was very difficult to console. I thought the heat might be an issue, but it also could have been the early wake-up or something else. I waited until the drink service to ask if the cabin could be cooled down. After service, the flight attendants must have asked the cockpit to reduce the temperature. As soon as it started cooling down, she went to sleep and slept the rest of the flight. If I’d used the call button before service, I could have saved everyone a half-hour of listening to a crying baby. Snack mix bags crinkle, and wow that is fun! Skyclub membership was helpful. This one in SLC let us put our stuff down and recharge mid-itinerary. Even as our daughter has grown, the Boppy pillow remains a favorite in the air. For our baby at least, the first night in each new hotel room was a rough one. I usually had at least a few wake-ups at unusual times in addition to the usual ones. I haven’t found a solution to this, but at least I’m now aware of what it’ll be like. Don’t expect a crib in the room when you arrive. I don’t care how many times you call the hotel. I don’t care if it’s the AAA four-diamond rated Fairmont Orchid and you noted it on your reservation, confirmed again a week before, and confirmed at the desk when you checked in. Do not expect it to be there. Expect it to take at least an hour and three calls to the service desk after you arrive (at 10 PM Hawaii time after traveling from the east coast - I’m still glaring at you Fairmont Orchid). We occasionally found the crib we had asked for (every time for our hotels in Japan, almost never anywhere else). But this seems to be something hotels in the US are more or less terrible at, so I’d say just imagine it won’t be there. We did purchase a travel crib, which we have used when my wife and I have traveled together. My daughter sleeps better in this, but the weight and added item makes it too cumbersome for me to take when it’s just me. Some places have been remarkably wonderful to work with. In particular, the folks who scheduled the Annual Keck Center Research Conference for the Gulf Coast Consortia were incredible. I was invited to speak at this event and initially declined because it was the day after a previously-scheduled return flight from Japan. After some discussion with the organizers, I decided to skip my final Detroit to Philadelphia leg and fly to Houston for the event before returning home. While in Japan, we found it hard to get liquid formula that we’d need for the Houston part of the trip. When I asked for suggestions of a place to buy formula near the airport or hotel, the folks from the event put enough bottles of formula at the hotel check-in that we were able to make it through the first night. Then I just had to walk to a store to buy formula before the meeting the next day. I also want to give a shout out to the folks from Northwestern Mutual’s HQ in Milwaukee. They hosted ALSF’s Young Investigator Summit and made traveling with the baby a breeze. Traveling with an infant may cost you some opportunities. I was invited to give talks both during a symposium and for the community in my area of expertise at the University of Oslo that would have involved weekend travel. When I asked the organizers to ask the hotel to add a crib to the room during the reservation process, this led to some red flags that ultimately led to the decision to find another speaker for their event and seminar series. The advice that I’ve gotten from folks on social media who traveled to work-related seminars where they needed to take their kids was to not give organizers a heads up and to deal directly with the hotel for a crib. If it’s an opportunity you can’t afford to miss, it sounds like this is still the way to go in 2018. However, if missing the event wouldn’t be hugely costly, I’ve found other places to be helpful and willing to ask the hotel for a crib when they make the reservation. Certain conferences and meetings also have very restrictive policies on children, so before you go it’s probably good to see where your society falls. I mentioned to a colleague that I would be at the American Association for Cancer Research (AACR) meeting with our daughter, and they mentioned that they had seen a scientist barred from the meeting because they were with a child. It turns out that AACR bans children from exhibit halls, poster sessions, and scientific sessions at their annual meeting though it does provide a childcare option that might work for some. The American Society for Clinical Oncology (ASCO) also bans children at their annual meeting and has not generally provided childcare for attendees. In 2019 both of these meetings include a weekend, making the policies even more family-unfriendly. On the other hand, the American Society for Cell Biology (ASCB) has clear, inclusive policies during the meeting. The Pacific Symposium on Biocomputing (PSB), a computational biology conference, has been family friendly for as long as I can remember. The American Society for Human Genetics (ASHG) and International Society for Computational Biology (ISCB) get special shoutouts for both providing childcare options and allowing children at the meeting itself providing parents with the flexibility they need. Speaker dinner for the Keck Center Research Conference. Our daughter spending lunch with me at PSB. I’ve enjoyed traveling with our daughter during this time. For fathers who are considering traveling with their infants to a conference or symposium, I’ve found that it is very practical to do so. I would be remiss not to note that we give women traveling with a baby far less support than men. There have been numerous situations throughout my time traveling that have made this clear to me. On multiple flights, attendants have offered to hold my daughter if I needed to go to the restroom. I haven’t seen the same level of support for women traveling alone with their babies. In one case, a flight attendant walked my daughter up and down the aisle of the aircraft to calm her. Even fellow passengers seemed less irritated by a fussy infant with me: in all of this travel I can only think of one dirty look that I got from a fellow passenger while I was traveling alone with my daughter. When you travel, offer assistance and understanding to women who need it as well.